The following email is a phishing scam. It tries to trick people into handing over some account details. The usual trick for phishing scams is to make the email sound important, and there’s a link in the email to make it easier to get to the scammer’s web site. Your ticket code is L690545X. The domain name they use is cua-members-australia (.com). 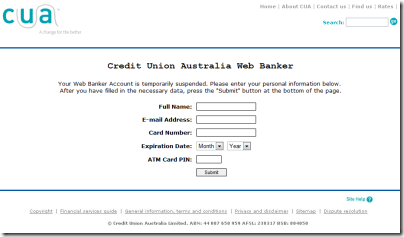 After doing some simple research, CUA is a credit union in Australia. Their real address is www.cua.com.au so the one provided is obviously fake, even though it might sound real. Further research shows that the fake address was registered in USA (even though these details could also be fake). They get straight to business asking for a card number and a PIN. Very private information that no one should ask you.